Caring for someone with a life-threatening illness requires careful and thorough evaluation, or "assessment," of their pain and other symptoms. You are the eyes and ears for the doctor and nurses caring for your loved one. You will be relaying important information about your loved one's pain and symptoms back to the healthcare team, so how can you do this in the best way possible? Assessing pain and communicating it to the healthcare team will be one of the most important things you can do while caring for a loved one. It is important when assessing pain to understand exactly what pain is. There are several different categories of pain. Pain can be acute, that is of recent onset, or pain can be chronic. It can be localized, or it can be diffuse. There are several different ways in which pain is generated as well, with these different mechanism leading to different experiences of pain. The important thing to remember is that pain is always what the person experiencing says it is, occurring when and where they describe it. If a person can communicate their pain, it will be easy to record it and relay it back to their doctor. If they cannot communicate what they are feeling, it is can be more difficult to assess their pain but it is still possible. To do so, you must aware of physical signs and symptoms that convey what they are feeling, which we discuss in more detail below. Assessing pain is something your healthcare provider will be doing at every visit or appointment, but it will be up to you to assess your loved one's pain between professional visits. The following information will be helpful to you as you assess the pain yourself. Ask your loved one to rate their pain somewhere on that scale. 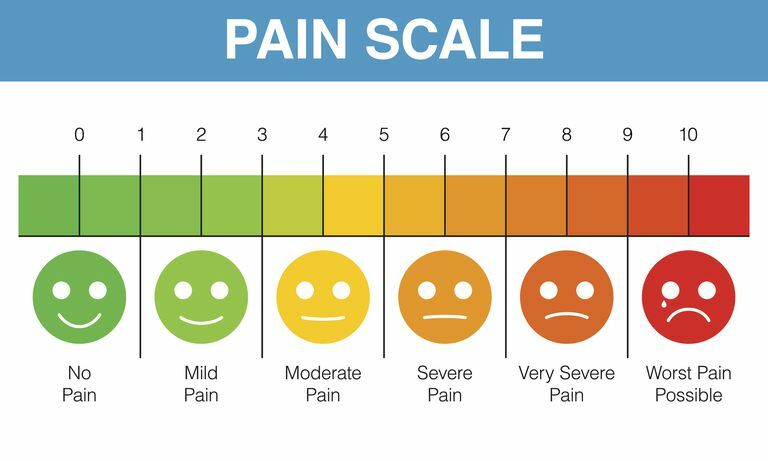 There are a number of different pain rating scales which can be used to make this process easier. For example, one scale referred to as the FLACC scale uses a description of several signs the person may be demonstrating, in order to estimate a number between one and ten. These include facial appearance, legs (whether relaxed, tense, or kicking), activity (whether lying quietly, squirming, or arched and jerking), crying, and consolability. When asking young children or non-verbal adults to describe their pain, the tool most often used by healthcare providers is the Wong-Baker FACES Pain Rating Scale. It is recommended for persons age 3 years and older. With this scale, you would point to each face using the words to describe the pain intensity. Ask the child to choose the face that best describes their pain, or look at the face of a non-verbal adult to decide which facial appearance on the table corresponds most closely to that of your loved one. Everyone will have their own acceptable level of pain. For some it may be no pain and others will tolerate a pain level of 3 on a scale of 0-10. It is important to find out what the acceptable level is for the individual you are caring for. If your loved one is happy at a pain level of 3, you wouldn’t want to medicate them to the point of sedation to get them at a zero level of pain. On the other hand, some people try to tolerate pain levels above a 4, even though these levels of pain often reduce the quality of life. The location of pain may be the same every time you ask. Someone with end-stage liver disease may always have pain in the upper right side of their abdomen. It is important to ask, however, because new pain may develop. If the location differs or new pain emerges, be sure to record that information and pass it on to your loved one's healthcare provider. Palliation and provocation are important assessments to make when evaluating pain. First, you can ask your loved one what makes their pain better, or "palliates" it. This may only be pain medications. It may be changing positions or lying only on their left side. Finding out what reduces pain will not only help you do things that aid in your loved one's comfort but may provide important clues to the physician as to the cause of pain if it's not already known. Also, ask what makes the pain worse, or provokes it. Again, it could be movement or lying on a particular side. It could also be eating or touch. This again will help you avoid things that cause discomfort and provides important clues to the physician. The more symptoms a person has, and the more intense they appear to be, the more you will get a grasp of the degree of pain they are experiencing. You can then record their pain as "mild", "moderate", or "severe". One of the most important things you can do for the person you are caring for is to keep an accurate record of their pain and their pain treatments. Once you assess their pain, record the severity and location and any medications or treatments that you give them. Take note whether the medications or treatments were effective. Also, write down anything new they may have told you about what makes it feel better or worse. This is a great way to team up with your healthcare professionals to provide the best palliative care possible. Your pain log doesn't need to be detailed, but a few components with help your healthcare providers better assess both the location and severity of pain, as well as treatments which are or are not effective. By assessing your loved one's pain, you can play a very important role in making sure your loved one gets the best treatment possible while suffering the least amount of pain. Using pain scales and keeping a pain log are good ways to objectify the pain a bit so that your doctor knows if additional treatment is needed. Keeping a record can also alert you to changes so that you can contact your healthcare professionals as soon as possible when needed. As a final note, caring for a loved one with a life-threatening illness is perhaps the greatest thing you can do for another human being, but it is also very draining. As much as you can, remember to care for your own needs. Ask for help and be willing to receive it. Pamper yourself, if only for a few minutes here and there. You may feel guilty trying to meet your own needs. But remember that you need to care for yourself if you are to give your loved one the best care possible. Remember the advice that flight attendants give us prior to taking off. Put on your own oxygen mask first. Broglio, K., and R. Portenay. Pain Assessment and Management in the Last Weeks of Life. UpToDate. Updated 09/12/17. McGuire, D., Kaiser, K., Haisfield-Wolfe, M., and F. Iyamu. Pain Assessment in Non-Communicative Adult Palliative Care Patients. Nursing Clinics of North America. 2016. 51(3):397-431. How Can You Survive Christmas When You're Grieving? How Much Life-Prolonging Healthcare Is Right for You? How Do You Write a Condolence Letter or Sympathy Note?